Every so often I attend meetings where entrepreneurs get to pitch their ideas to investors. I love going to these meetings because they are a lot of fun, and they give me an opportunity to get together with entrepreneurs who are enthusiastic about their companies. Plus, listening to other folks pitch their companies is always an entertaining and educational experience. However, it always surprises me that many presentations are not well done. A few are drab and uninspiring. Others have simple mistakes, like typos. A few touch on pet peeves, such as adding up management’s years of experience and pretending that it is a useful metric. Is there a problem with this chart? First off, the chart shows that the company goes from $0 a month to $1,500,000 a month in a year. While some startups have done this, most don’t. And those that have achieved this growth don’t often follow the orderly pattern of growth depicted in this chart. That, in itself, is a tell-tale sign that something may be wrong. And yes, there is a pattern to this growth – one that mixes orderly growth with aggressive jumps. This takes me to the second problem. Growth from February to May happens at the same rate. Likewise, from May to September and from October to November – all of those have big jumps in between. It’s easy to spot if you pay attention. You can see where this is going; the presentation has effectively jumped the shark. Most entrepreneurs develop their growth projections by purchasing a business plan template and plugging in some estimates. The problem is that these estimates are seldom well thought out and researched. 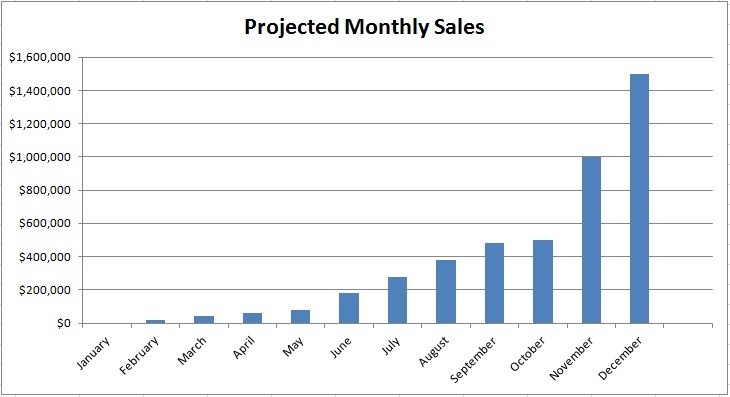 Instead, the entrepreneur makes aggressive guesses and really crappy and unrealistic sales forecasts. This last point is the bigger problem. But why would entrepreneurs do this? In some cases, it’s because real market data is hard to get. It often requires spending some serious time crunching numbers. Guessing is easier and takes less time. And yes, this happens every day. The issue is that entrepreneurs know that the only way to convince investors to put money into their business is to show them an incredible opportunity – a high rate of return that compensates them for the risks that they are taking. Since the entrepreneur needs money, they have an incentive to create sales forecasts that are as “optimistic” (inflated) as possible. They also know that, to convince investors, they need to appear very confident. This creates a perfect storm that leads to a huge presentation blunder. You end up with an overconfident entrepreneur presenting unrealistic numbers in front of a bunch of experienced investors. The result is that they come off as both naïve and arrogant. Most experienced investors will grill them to a crisp with incisive questions while ripping their business models to shreds. In conclusion – don’t do it. Many years ago, I was reviewing a business plan that had a chart very similar to the one pictured above. Within a few minutes, it became clear to me that the entrepreneur had no idea what his expected sales would be. Instead, he had cobbled together some numbers that were meant to look impressive. During the meeting, I mentioned that at the end of a year they would have an organization that is invoicing millions of dollars per month. Since his projections also included operating expenses, I asked him to describe the type of organization needed to support those revenues. Incidentally, I asked him to go into details since I wanted to grasp the depth of his plan. The solution is simple: hard work. You need to spend some serious time building your financial model and checking your assumptions. Get professional help if you need it. But your financial forecasts should be well thought out and defensible. And your methodology for developing them should be impeccable. Also, keep the overconfidence in check. This advice may sound hard to swallow, but be willing to admit that your forecast, like any forecast, is not perfect. Your methodology and assumptions need to be sound and reasonable. If your methodology is sound, investors will believe in you. And if they believe in you, your chances of getting funded will improve. Keep in mind that most angel investors consider that even the most thought-out financial projections are works of pure fiction. Everyone takes them with a grain of salt since few founders ever meet their goals when expected. However, going through this review process allows investors to gauge your level of involvement, business maturity, attention to detail, and, more importantly, your honesty.